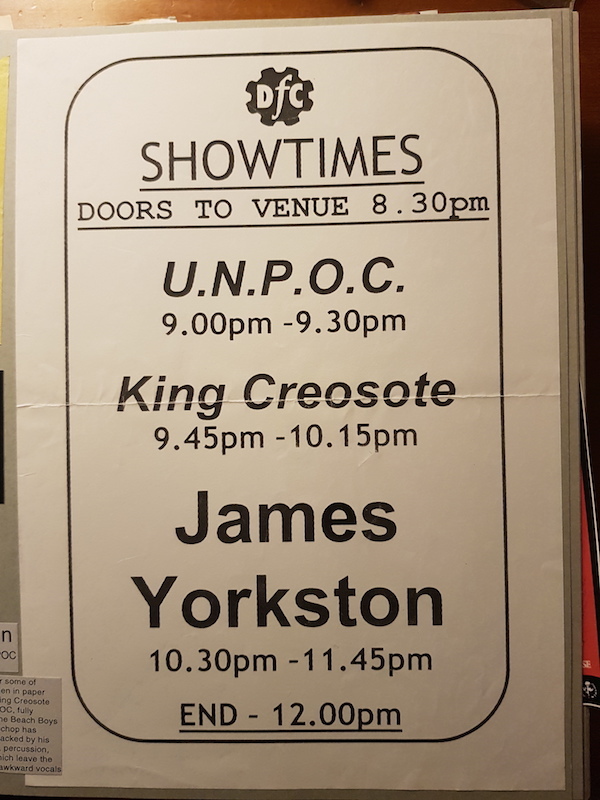 I was quite nervous of gigs at first. Then I got quite into it for a bit, even doing three nights in a row once. Here's a list of all the gigs I've done. There aren't that many, 23, but I've been quite lucky with them, I think, because there's a good variety, small things in pubs, big support shows, some festivals, and a few headline shows. A good mxture of UK and overseas too. I flew out to Sweden 6 times in 5 months, I see. There's a Bavarian wedding gig and a London birthday show in the list too! 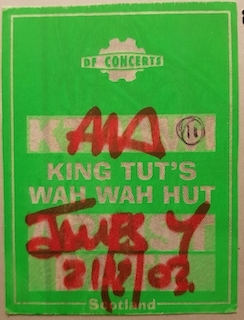 21.12.03 Glasgow, King Tut's supporting James Yorkston. First proper gig! 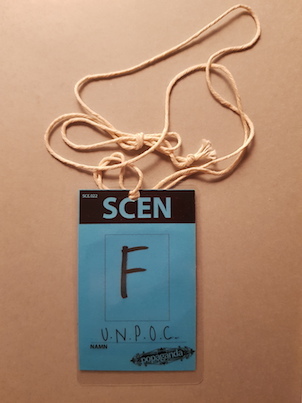 29.05.04 Stockholm, Sweden Popaganda festival, main stage, 8pm on the Friday. (guest vocals by The Concretes' Lisa, Maria and Victoria). (guest vocals by Victoria Bergsman, ex of The Concretes, now of Taken By Trees). 28.10.04 Linkoping, Sweden Klubb John Doe, Herrgar'n - Oldest indie club in Sweden! (guest drums courtesy of Steve Mason!). 02.07.05 Bavaria, Germany Wedding show near Rosenheim for Nick & Manuela. 22.10.05 Putney Club, London Special Party gig for 40th Birthday of Laurence, the Domino Records chief. 27.11.05 The Caves, Edinburgh 25 minute set, part of a Fence night. 03.12.05 Alexandra Palace, London Supporting Franz Ferdinand. 23.04.06 Anstruther, Fife Part of Fence Homegame 3. 03.06.06 Conway Hall, London Part of "Homefires 3". 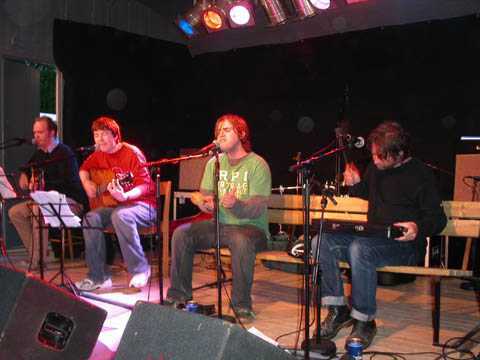 31.10.03 Anstruther, Ship Inn Two songs, first live show. 10.06.04 Edinburgh, The Venue I paid full-price to get in to this one, by mistake, not knowing I'd be asked to sing. The Venue was my favourite Edinburgh venue. It's an art gallery now, which is actually quite nice because I can have a wee look inside whenever I want. 09.01.05 Anstruther, Ship Inn with Steve Mason (Beta Band) on drums! 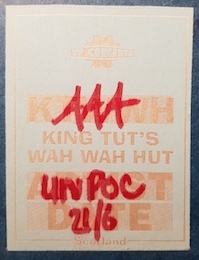 The first proper unpoc gig was at King Tut's. We did another show there exactly 6 months later. 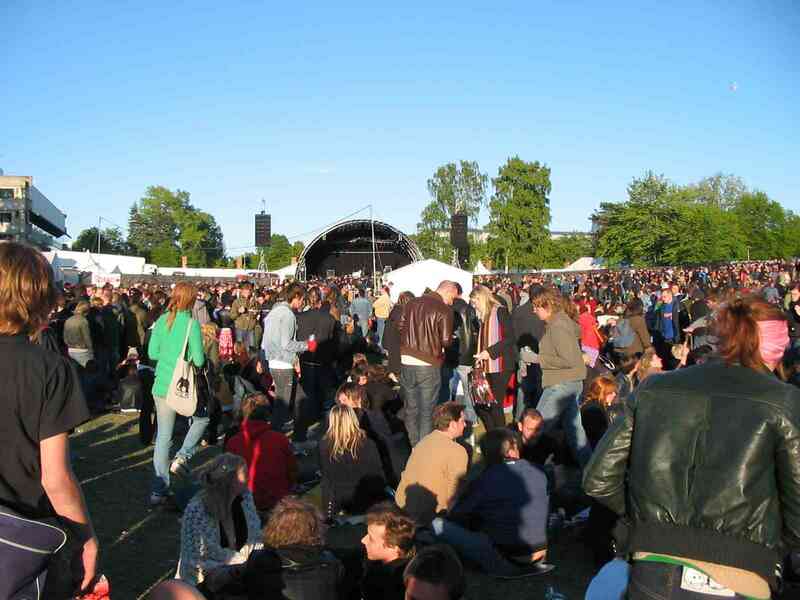 My third gig was also my first Swedish show, at Popaganda festival (Stockholm, May 2004). 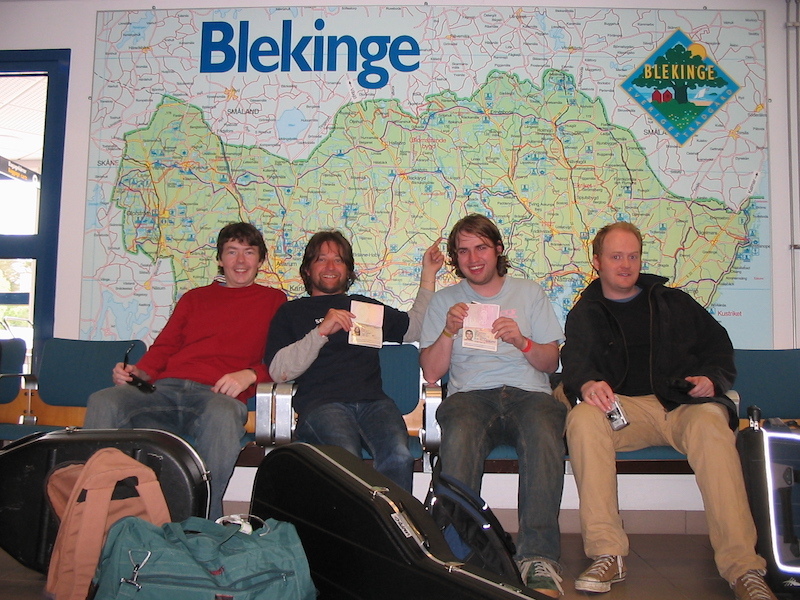 I had never been to a festival at this point, or to Sweden, and it was only my third time on a plane, so it was all quite new to me. It turned out that the audience knew the songs and were happy to see us. What a great place! 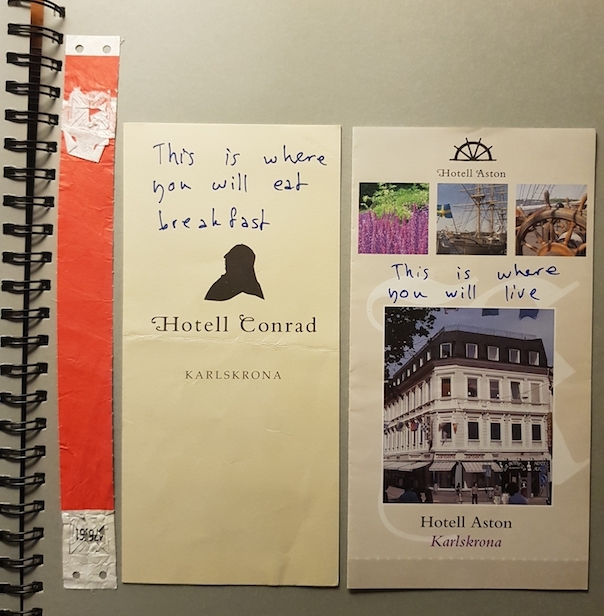 Show 4 was in Karlskrona, right in the south of Sweden, at a tiny festival called Rundgang. Here's my wristband and hotel instructions. It would be a nice place to live, Karlskrona. That's me with Kenny, Johnny, James (percussion, percussion, guitar). 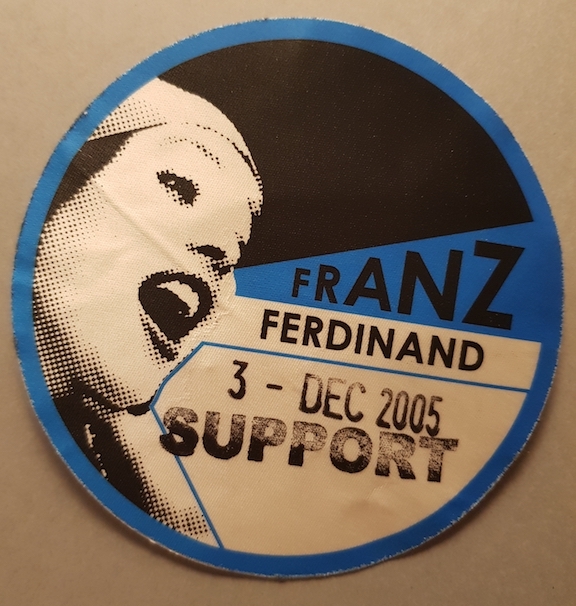 Security sticker for Alexandra Palace support show (Dec 2005). 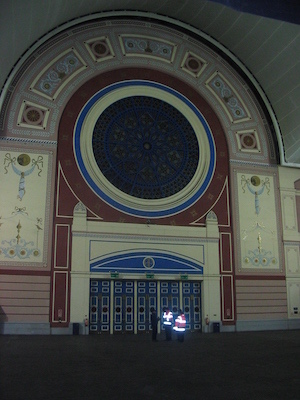 Alexandra Palace was our biggest indoor show, playing to 8,000 Franz Ferdinand fans. It was the last night of their UK tour, and the last of 4 nights they were doing at Ally Pally. What a big hall. 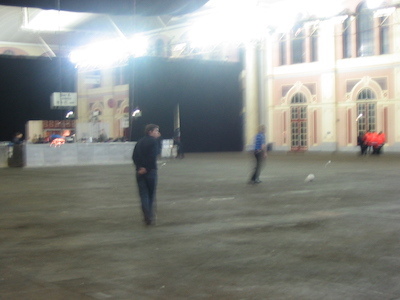 In the pic below, I'm having a pre-gig wander and some of the Franz crew are kicking a football around.